Probably best I give you some background to this article first. I started running in February 2010, like most people do; I put on the runners I had around the house, a pair of shorts a t-shirt and just went running. After some advice from other runners and a coach I slowed down and started to improve my aerobic fitness, so I could run longer distances. In May the same year I completed my first half marathon. I was feeling really good about my running abilities, so I decided to start marathon training, but got an injury in my left shin. With rest and a different pair of runners it went away, never to return. Thanks to that injury I had to back out of the Auckland marathon. That experience didn’t deter me though and I started training for a marathon in April 2011, the Connemarathon no less! Training went well, but I started getting hamstring issues and that interrupted my training to the extent that I missed some of my long runs. The marathon itself was excellent and the first half of the race went really well. Then the first real hill came along and I had to walk, with hamstring pain, and did a run/walk/run from there on, especially on the last hill (mountain) called “The Hell of the West”. I managed to build up my speed going up to and over the line, but I was in pain. It was mainly my right glutes and the top of my hamstring. 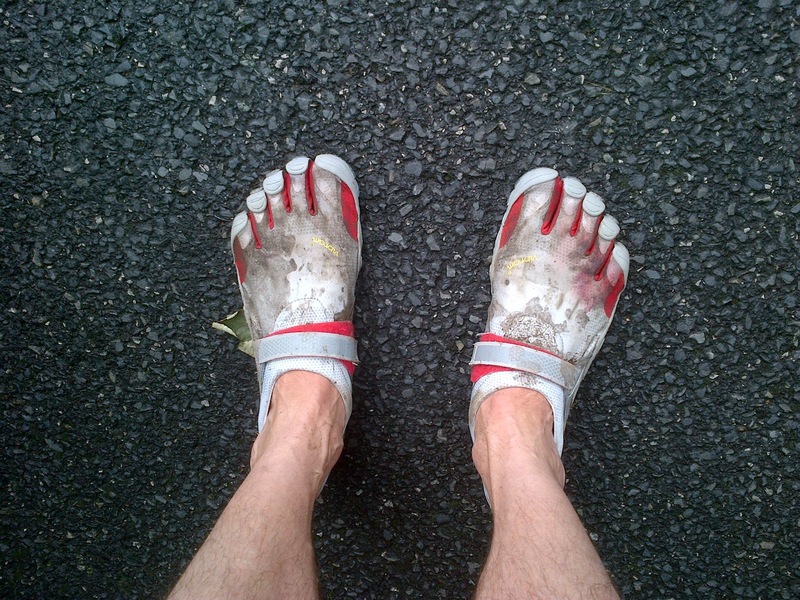 A month after Connemarathon I bought a pair of Vibram Five Fingers (VFF) Bikilas (see pic). I had read lots about them and knew I needed to take it slowly. I started off jogging to the local shops and back. Then when I felt ok with that I would wear them for my warm up of 3k or so and take them off and put on regular runners for the main part of my run. Because I was back in marathon training, I wasn’t doing many short runs, but I did manage to build up to 7-8k easy runs twice a week over a few months. Pretty quickly I found that my track sessions were faster in VFFs. Probably because you are almost forced to run with good form and efficiency in them. Fast forward to August the same year (2011) and I was in full on training (80k+ a week) for the Dublin Marathon when, two weeks before the race, my hamstring gave out 16k into the last of the long runs. I had trouble walking, and the 4k I had to walk home took nearly an hour. No amount of physio visits or sports massages seemed to help and three days before the race I decided I had to pull out. From then it was three months of physio and short test runs with no let up from the hamstring. When I did get back to running (Feb 2012) I set myself no goals apart from getting my fitness back. I didn’t want to be pushing myself too fast too soon. One thing I did tell myself was that I was going to be doing more runs and distance in the VFFs, because I felt I hadn’t given them a proper go in 2011. My first race of 2012 was a 6.5k (4 mile) cross country race. I had bought some KSO Treks for this and other trail/CC races and decided to try them out. I finished my race slowly, but in no pain at all (pic below). It didn’t take long before I realised that after I did runs in normal runners my hamstring was sore, after runs in VFFs it was fine. Not only that, but the next day my legs felt fresher too. I had been planning on running 2-3 marathons in 2012, but after the hamstring issue I decided to concentrate on 5k-10k races and see how I got on. I kept alternating runners and VFFs, gently building up the distance to about 5-6k again. Taking time off really hurts! After a few months I was feeling more and more comfortable in the VFFs and wanting to run in normal runners less. I signed up for the Dublin Race Series, which is four races comprising of 8k, 10k, 16k and a half marathon (21k), each about a month apart. I did the 8k race at the end of June in the Phoenix Park. It was chilly and wet with about 4,500 runners hanging around for the start. I met a few people I knew but every time I stopped a total stranger would ask me about the VFFs I was wearing. I’m always willing to talk about them and my experience, but I was trying to get “in the zone”, so I did my warm up and headed to the wave 1 pen. The race went really well, but I was really feeling some tightness in my calves from the 5k mark or so. I pushed on and managed to finish in 36:47, a PB by over 90 seconds. I hung around chatting to people I met and then jogged very slowly back to my car. My lower legs were really tight at this point! The next day I went out on my bike to try and loosen up the legs. It helped a little, but for the next few days I was walking slowly. I did an easy run on the Tuesday evening and then on Wednesday evening I was at the start line of another race! This time it was a local 5k and it was a glorious evening, about 22 degrees and very little wind. I was seriously thinking of using normal runners for this as my legs still felt tight. Then I remembered the old saying, “If you want to take the island, burn the boats”. Ok, I didn’t burn my runners, but I left them at home and drove to the race in sandals with my VFFs in my race bag. I gave myself no option to back out of running in them. I got a warm up done with two club mates and we got ready. I hadn’t even checked the course or elevation! Anyway, I went out with no big expectations, having got a PB in the 5k less than a month before. There were a few small hills, but rolling hills, nothing steep. I decided not to look at the Garmin and just race by feel. With 1k to go I was getting pretty tired and my legs were feeling tight but I pressed on and ran down the finish chute, overtaking a few runners and finishing in 21:59, a new PB! I was delighted and stood around chatting to clubmates before going home, grinning the whole time. My lower legs were still tight, but not as bad as they had been earlier in the week. I did some stretching, walking and slow runs and they eased out after a day or so. A week later we went on a family holiday to Portugal and I took the VFFs. I got in three runs, two in the VFFs, but it was around 35 degrees, way warmer than I’m used to, so all my runs were pretty slow. After the week in Portugal we got back on a Thursday and my next race was on the Sunday. I didn’t have much time to prepare, but I already decided to do the 10k race (second in the Race Series) in the VFFs. I did a slow 1k warmup and got into the wave 1 pen (sub 50mins). It was a tough race, quite hilly, warm and humid. My lower legs didn’t feel great going into it and I never really got a good pace. I finished in 47:30 or so, over 2mins over my target time. But, it was the longest run or race I’d ever done in the VFFs, so I was happy from that standpoint. I recovered pretty well from the 10k, but as the next race in the series was five weeks away and 6k further I knew I had to get down to doing more in the VFFs if I didn’t want seriously tight legs afterwards. By this time, my training schedule was including a mid-week 10k easy run. I decided I had to start doing them in the VFFs and one or two other runs a week in them also. I started getting in the mid-week run and also my 40mins Sunday recovery run in the VFFs (around 8k). After two weeks I decided to split my weekend long run in two, and do it all in the minimalist runners. On the Saturday I did an easy paced 11k and lots of stretching afterwards. The following day my legs felt great, so I went out to aim for another 10k in them. By the half way mark I knew 10k would be easy, so I kept going and at around 9k I decided to bring the pace up from 5:30 to 5:20. With 4k to go I brought it up to 5:00 and for the last 1k I did it at 4:40 pace. I got a total of over 15k for the run, or 26k in two days in VFFs. No issues at all! Previously if I had done a 10k in normal runners I would get knee and hamstring pain. After these two runs I had neither and my lower legs were feeling good. Monday was a day off and on Tuesday I did a hill/trail/cross country run with the club in KSO Treks. I think I was the only one who didn’t slip on the mud and was the fastest downhill. The KSO Treks have a better tread than normal runners. It was tough on the legs, but felt fine the next day when I went for another 10k on the local roads. Earlier this year I was planning out my weekly runs and trying to decide which I could run in the VFFs. I’ve now gone 180 degrees and am now figuring which ones I won’t do in them, to give my lower legs and feet a rest! In general I am not using them for shorter runs as I don’t want to do longer runs in normal runners and get aches and pains back again. So after five weeks of building up from the 10k race I was feeling good and ready for the third in the race series, the Frank Duffy 16k (10mile) race in Dublin’s Phoenix Park. On race morning I had my usual brekkie and kept myself hydrated. I had all my running kit ready the night before, so I didn't have to go looking for anything. In training I'd been running 15-16k without water, so on the day I didn't even think about bringing any. There were two water stations on the course anyway. I left the house at 9:15, a bit later than I wanted, but time enough to get there. After parking outside the park I jogged to the start line. I checked my garmin to see what pace I was running at and was surprised to see it read 8:30-ish. Then I remembered that Garmin Support had asked me to do a hard reset on it the day before, so it had returned to all it's defaults, including miles, not metric! I quickly changed it and kept going. Anyway, I made my way into wave 1 (sub 80mins) and met up with 4 runners from the club and got chatting. I was hoping to beat last year's time of 1:21:23 and get under 1:20 if all went to plan. Pretty soon the air horn sounded the start and 6,000 of us took to the roads and paths of the largest fenced park in Europe. I kept myself held back for the first 2k or so until I found a happy pace, one that I could keep for the distance. I knew the hills came at around 10k, so I wanted to keep something in the tank until then. About 3k into the race, a runner pulled up alongside and started chatting about my VFFs. I told him about my experiences and shortly after he moved away, hoping to get under 73mins. The first water station was at about 4k, I didn't slow my pace much and only took a couple of small sips of water. From 6.5 to 9.5k we were running along the main road through the park, Chesterfield Avenue, which is reasonably flat. Then we turned right and went downhill followed by the first real hill at 10.5k. I dropped my pace a bit, but kept the cadence up and pumped the arms to keep me moving, which definitely helped. At around 11.5k we had the second (and last) water station, just before more hills. I decided to take a cup and walk to get as much in as I could and started back attacking the hills again. Just past the 14k mark I knew we were past all the hills and didn't have much left in the race. Two of the toes on my right foot were rubbing badly, I knew I had blistered and every step was sore (all thanks to getting my feet wet before the start). I decided that I'd be finished quicker if I ran faster, so I did. I knew there were just two right hand corners left (memorizing the course route beforehand is a big help! ), and I knew the distance left (thanks to my Garmin), so I treated it as a progression run. I didn't want to get over the line and be full of energy, I wanted to put in as much of myself as I could. This was taken with about 150m to go. I kept increasing the pace and going over the line my pace was 3:30, which I was delighted about. Immediately over the line, another runner started asking me about my VFFs! I was very polite, but I was well out of breath. When he said goodbye and left I then realized I hadn't stopped the Garmin. Too late, but I got a text message later to say that my official time was 1:16:59, woohoo!! That's over 4 mins off my previous 16k time! I got some water and a couple of bananas and my goodie bag and walked back to Neal (the cameraman) and we waited for the rest of our clubmates. After they had all come in and we had chatted I jogged slowly back to my car. My right foot was in a lot of pain now, but I didn't want to take the VFFs off until I could do something about it and I reckoned they would keep a lot of crap out of the blisters too. I took this pic with my phone when I got back to the car. You can see the blood stain on my right foot by the toes. I jogged back and cheered on the runners as they were finishing. At the car I had more bananas and my recovery drink and water before going home and taking care of my toes. Three of my toes had blistered and two of them had burst. I had to cut the excess skin with a scissors, wash the toes and spray a disinfectant (which has a bit of a kick!) on them before covering them up. All in all, despite the blisters I felt great afterwards and felt like I could have kept going at a steady pace. I really enjoyed the day and the weather was really good for it, about 16 degrees and partially cloudy. I think the main reason I was able to increase my pace at the end was due to my weekly progression runs that I've added in lately. Time to recalculate my goals, get some advice on VFFs and blisters and training for the HM in three weeks! With just two weeks to go I was going out for one of my two weekend runs and while on the run I decided that I should just do one long run and aim for the HM distance (21k) or close to it. Things went really well and I was able to keep a good but easy pace in the VFFs. The last section of the road I was on had recently been resurfaced and it was still quite lumpy and about 4k to go I ran over a stone with my right foot. I didn’t feel sore at the time, but about five minutes later it had inflamed was tough to run on, so I slowed down. I ended up with 20k in the VFFs, my longest run ever, but with a sore foot. The next day or two I had issues walking and I booked a session with a local physio. She confirmed that I had some inflammation on the outside of my right foot and I wasn’t to do any running, but to ice it and see her again on Friday. So I decided to do cross training every day until I could run, to help keep my fitness up and keep me in shape. The week before the half marathon I did a track session on the club’s grass track, which went well and no foot pain. I was really tired all week, so skipped running on Wednesday and went to the track again on Thursday. After that session, which wasn’t too intense, my foot was sore in the same place again. I iced it when I got home and didn’t run on Friday. On Saturday, the morning of the race, it felt ok and I went about the pre-race usual things of eating and hydrating. After driving to the Phoenix Park and parking up I jogged to the start line. My foot was sore in the same place again! I knew I’d be able to push through, so I abandoned my Plan A of getting a PB and went with Plan B – to run the race in the VFFs at whatever pace I could.